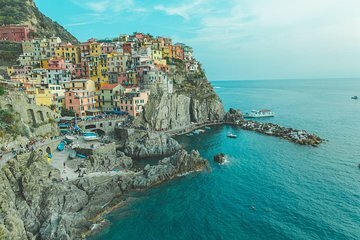 Sample the regional specialties of the Cinque Terre with a 2-hour tasting tour in Riomaggiore of the best local food and wine. Savor delicious food and drinks that are locally-made as you learn about the region's culinary history and traditions. Taste the best of what the Cinque Terre has to offer with a 2-hour culinary tour of Riomaggiore. Walk to the terrace at the marina and enjoy the views overlooking the town and out to sea. Stroll back toward the town center to visit several food and wine shops. Sample regional specialties like focaccia, pesto, anchovies, Ligurian olives and locally-made wines. Taste only what's in season, meaning the options will vary depending on the time of year, but it will always be fresh. Enjoy a short uphill walk after all those delicious treats to visit Riomaggiore's primary church. Take in yet more glorious views. See terraced hills with vineyards and groves of lemon and olive trees in one direction, and look the other way to see the sea in the distance beyond the town's rooftops. Finish the tour at the Riomaggiore train station after another walk.